1. Whisk together the miso, vinegar, mirin, lime juice and 1 tbsp water; set aside. Put the flour or cornfl our and chilli flakes in a large bowl and gradually whisk in the almond drink and egg yolk to make a loose batter – about the consistency of double cream; season. Tumble the cauliflower florets through to coat. 2. Put the oil in a large saucepan. For safety, it must not reach more than halfway up the sides of the pan. Place over a medium-low heat. 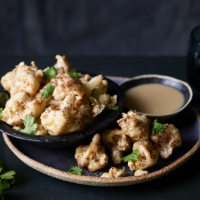 When the temperature on a thermometer reads 180˚C or a cube of white bread turns golden in 30 seconds, carefully lower a third of the cauliflower into the pan using a slotted spoon. Cook each batch for 8-10 minutes, turning the florets gently with the slotted spoon so they cook evenly, until golden all over. Remove to a plate lined with kitchen paper and keep warm in a low oven. Serve immediately, scattered with the coriander leaves, and with the miso sauce in a bowl for dipping.